Why do entomologists kill insects? Admittedly, this isn’t really a direct user submission per se, but it’s a question which comes up in the entomological world enough to warrant a discussion. Collecting of insects is not controversial amongst entomologists, but seems to strike a chord with many people who are interested in entomology. There’s the perception that entomologists are like big-game hunters and kill insects simply as trophies. Some of the comments regarding this topic can be quite… passionate …and there’s been a lot of heated discussion about why people collect and kill insects. Anti-collecting comments from Facebook Entomology group, posted under undergraduate collections. The reality is a bit different from the perceptions of the posters above. Insects are collected for many reasons, and killed for many more. Taxonomists, the entomologists who describe new species and classify life into systematic groups, often bear the brunt of the blame for insect-killing. Consequently, there’s been a lot of discussion on the internet by taxonomists who explain why collecting is essential to science. Many people are concerned that scientists are helping lead to the destruction of insect species, however the few specimens that scientists do collect for research purposes are not contributing to species loss. A much more pertinent threat to insects is habitat loss and degradation. The posts we linked to are our favorites which explain why killing insects is essential to preserving them, as paradoxical as it may seem. While taxonomists have done an excellent job of discussing why they collect insects, there’s been a lot less attention to why insects need killed in the course of education, pest control, and research…and that’s what we want to mention in this post. We want to discuss the reasons entomologists kill insects in order to further the understanding of their biology among the public, to insure the survival of our agricultural systems, insure our own survival, and so we can further our understanding of their biology. Although we love insects, we’ve always been a bit uncomfortable with entomology as a field. Insect biology is extremely cool, because Lovecraftian or Kafka-esque biology comes standard with most species. Some insects eat their own mothers, while others will essentially age backwards to escape starvation. The majority of insects change into completely different creatures when they turn into adults. They’re so far removed from anything we can identify with, that you can spend hours at a time reading about their biology. Whereas most people have golf magazines by the toilet, Joe’s current reading material is about a group of caddisflies which lay their eggs in the arms of a sea star. Most entomologists are this way, and many of our conversations with our colleagues and co-workers revolve around this sort of stuff because everybody we’ve ever worked with has been as passionate about insect biology as we are. However, a lot of entomologists (ourselves included) must research new ways to kill insects even though we love them as organisms. So … contrary to what some posters above have said we love insects, but we also research new ways to kill them. 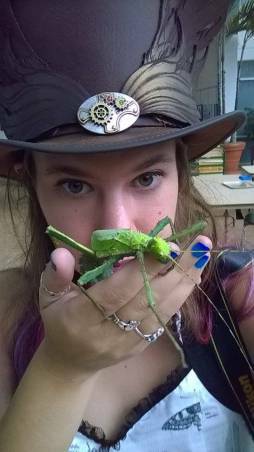 Nancy with a Malaysian Jungle Nymph. 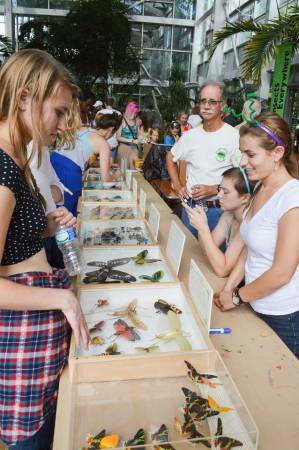 Public outreach with preserved specimens. 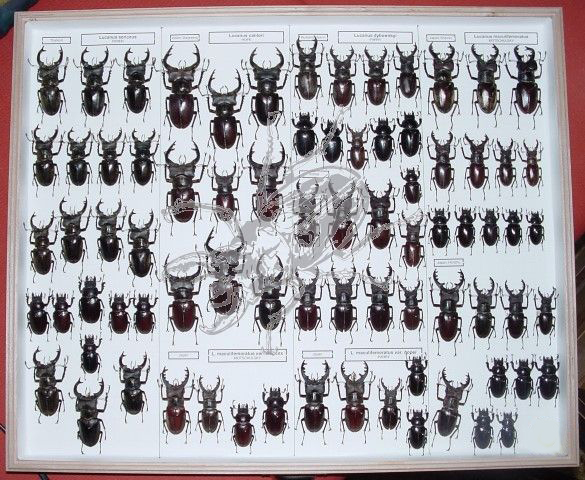 In contrast to live collections, preserved insects are often for sale and there are fewer laws pertaining to the possession and selling of these items. Therefore, with these artfully done collections, we can captivate the curiosity and wonder of children and the public. We can make people who had been fearful, disinterested, or disenchanted with insects become curious, astounded with their natural beauty, and wonder about their remarkable biology. With collections, it is possible for us, as educators and scientists, to visit rural schools in Georgia, USA and show children what insects in rural Africa look like. And while some of this can be done with photography, having someone see with their own eyes a physical specimen the size of their head cannot be replaced by mere images. Everybody needs to eat. Agriculture is the cornerstone of civilization, and by 2100 we’re going to need to be a lot better at agriculture because there may be as many as 11 billion people on this planet. Unfortunately, agriculture is also extremely inefficient. For every 100 lbs of food which could potentially be harvested, only about 30 lbs is used by consumers. Some of this is waste, but a lot of this is pest damage. As an agricultural scientist, Joe looks at the situation like this: Of 100 lbs of food grown around the world, 70 lbs of it is lost along the way on average. Of those 70 lbs, 35 lbs of that is lost in the field before harvest. If every farmer stopped all pest control measures, that number would increase to 70 lbs of food lost before harvest. Without any additional increases in efficiency between field and table, the amount of land needed for agriculture would explode…and that would not be a good situation. Our biggest animal competitors for food, fiber and shelter are insects. Insects attack food products at various points in the production chain. The examples which spring most readily to mind are those which attack plants in the field, but insects also attack food while it’s being stored. On average, pest and disease losses in the field are between 20 and 40% depending on the crop. In storage, 10-15% of the crop can be lost to pests and the value of the harvest can be dropped by up to 50% due to loss of quality. Complete losses of some crops aren’t uncommon either. Insect infestation also leads to other problems by encouraging the growth of mold that produces aflatoxins, so the losses due to infestation can lead to larger losses due to a loss of quality. While this secondary problem might sound minor, aflatoxins are among the most carcinogenic substances known and are thus one of the biggest and most persistent public health challenges. To give one very specific example…you might have noticed the increase price and decreased quality of summer berries this year. That’s because a recent invasive species, Drosophila suzukii, has been scaling its way up the eastern United States. Although it has been in Hawaii since the late 1980’s, by 2010 the fly had been spotted in North and South Carolina, Louisana and Utah in addition to Michigan and Wisconsin. D. suzukii deposits its eggs in summer berries like blueberries, raspberries, and blackberries. 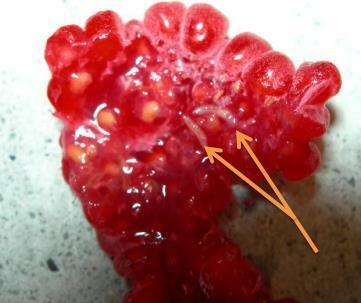 The maggots eat the flesh of the fruit, but seem to leave unnoticeable damage until the berry is broken into which exposes many the little wriggling maggots. As you can imagine, this makes the fruit unmarketable. In 2008 alone this fly was responsible for $500 million worth of damage, and some farmers lost 80% of their crop. It’s possible that other countries will refuse to buy our fruit out of fear of accidentally introducing this pest, so there are economic consequences beyond yield loss. 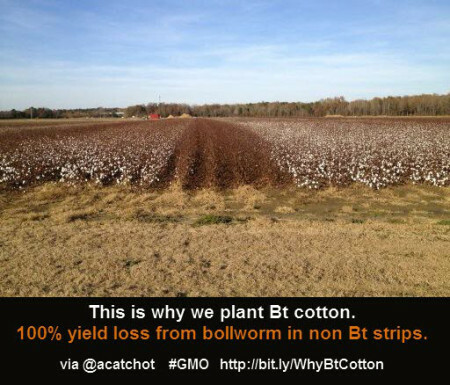 In order to protect the livelihoods of these farmers, someone has to figure out how to manage this pest and lots of research has gone into understanding its basic biology. Agricultural scientists work towards solving these problems by developing better tools for controlling insects. In some cases, insects can be controlled by making the environment really tough to live in through the use of biological controls. In some cases, this isn’t a feasible option and insects need to be controlled through other means. Either way, if we didn’t control insects there would likely be widespread starvation or exorbitant food prices. 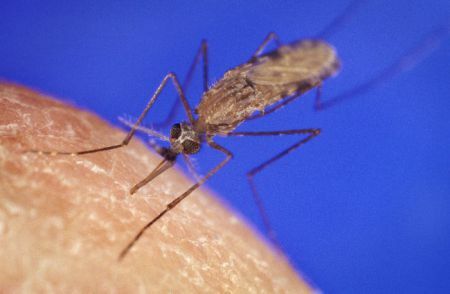 Anopheles gambiae, a mosquito responsible for more human suffering than war. James D. Ganthany, via Wikimedia commons. Diseases spread by insects are another huge problem for public health, mostly in developing countries. Every year almost a quarter-billion people contract malaria, and well over half a million die worldwide from the disease. In areas where the disease is found, it can affect every conceivable aspect of life from how people make money to how many children they have. It may be difficult to believe, but malaria was in the US as late as the 1940s. In the year 1934, there were 140,000 cases…and the disease was effectively gone from the US by the early 1950s. A combination of a convenient climate, a good economy, pesticide sprays, and habitat elimination facilitated this. Vector control continues to be an extremely important component of public health measures, because we continue to see malaria imported into the US from travelers. The story of malaria is an important one, because it demonstrates how important vector control is for maintaining a healthy population. Worldwide, over half the population is at risk for contracting a vector-borne disease. The US is no different, although we are relatively fortunate to have the resources to fight these diseases and a climate which makes them easy to combat. Keeping the populations of disease vectors down is really important. In short, medical entomologists work to reduce human suffering by killing insects. This last one is admittedly the purpose of killing insects which the posters above were talking about. Collecting insects is essential for documenting their presence for a number of reasons. Many insects (as discussed in our first post) are simply too small to see, and a lot of collection methods kill the insects during the course of collection. In addition, a lot of important insect parts need to be extracted for species-level identification. Often the methods required for this aren’t possible to perform on live insects, and when they are they often injure the insects anyways. The posts written by taxonomists give more details about these methods. There are a lot of research methods which require live field collected insects. Sometimes, you’re interested in biological characteristics of insects in the real world and captive reared insects just can’t be used to answer those questions. Other times, the insects you’re interested in may be impossible or impractical to rear in captivity. Bee research is a good example of this sort of limitation, there are a lot of bee species which can’t be reared in captivity. In bee research, researchers are often interested in real-world responses and this necessitates the capture of live insects from the field. Questions about presence, life history, abundance, and seasonality are all most effectively answered through collection techniques that kill the insects, but otherwise these questions, like questions about native pollinators, could not be answered. Entomologists are uncomfortable killing insects, and we don’t take it lightly. If we did, we wouldn’t be very good at our jobs. Most entomologists are deeply concerned about environmental issues, and have thought long and hard about why we’re doing what we’re doing. There are a lot of protocols in place to make sure our experiments don’t result in the extinction of species…and we’re constantly working to make public health and agricultural practices more sustainable in the long-term. Although it may seem paradoxical, wise management of insects for public health and agriculture is an environmental concern, and most entomological conservation research would not be possible without killing insects. How do you mount insects and keep them from decaying? First, you need to catch the insects. Therefore you need a basic equipment…beating bushes, nets, malayse traps, pitfall traps, light traps… there’s all kinds of ways. There are different traps for different kinds of insects, you won’t catch a butterfly with rotting meat, but you’ll get tons of detritivores, for example. Even though there are so many insects they can still be hard to catch. Most hide under a cover of darkness or in a disguise or camouflage. These are used mainly to catch ground-living invertebrates or flying insects. The most commonly used trap is the pitfall trap, a jam jar sunk up to its neck in the ground and charged with bait. Baited with meat, pitfall traps are ideal for catching the predatory and carrionfeeding ground beetles which are active at night. Once they fall inside the jar they cannot climb the smooth sides to escape. Care must be taken to check the traps at regular intervals – perhaps every hour or so – to prevent the beetles killing each other. Make sure that no sticks fall inside the jar as the beetles will climb up these and escape. A flat stone propped up above the jar prevents shrews from getting in and eating your catch. When not in use, traps should always be removed. Sugar traps attract nectar-feeding insects, especially moths. A thick solution of treacle and sugar is painted on to a tree truck, wall or fence post and visiting moths can be examined by torchlight, though there are often daytime visitors too. A sugar trap resembles the natural weeping sap wounds on trees which are sometimes visited by clouds of butterflies. Light traps attract night-flying insects, especially moths and flies, although beetles and bugs are also attracted. A fairly powerful beam is needed – a household torch is not bright enough – which is shone on to a white sheet to diffuse the glow. Insects flying on to the sheet are easily picked off or examined. Oil-fire Tilley lamps or camping-gas powered lamps are quite bright and easily carried but a small headlamp run from a car battery is most effective. For best results site the light trap where there is little interference from street lamps or house lights. More sophisticated light traps using powerfully attractive mercury vapour lamps can be bought from suppliers but they can be awkward and heavy to transport. Butterfly nets are one of the most useful tools for catching flying insects that you can possess. With practice, butterflies, moths and flies are easily caught and transferred to a pill box for examination at close quarters. Butterfly Nets with a toughened rim, usually known as sweep nets, can be swept through long grass and herbage to catch a mass of unseen creatures which would otherwise remain hidden from even the most careful searcher. A variation on the butterfly net is the pond net or dip net. Pond nets are strong nets with a gauze mesh that offers little resistance to water but which strains out aquatic invertebrates that are then trapped in the bottom of the net. They can be swept back and forth in open water or pushed through beds of water weeds. Sieves are used mainly for sifting through leaf litter for snails or soil-dwelling invertebrates such as centipedes and millipedes. The leaf litter is passed through a series of sieves with a gradually decreasing mesh size and the animals picked out from the sieve which they are too big to pass through. Professional sieve kits are expensive but soil sieve kits from garden centres are cheaper. However, their use is limited as the mesh would not be fine enough to catch the very smallest creatures. A beating tray is a square of light-coloured cloth, or even a light-coloured umbrella turned upside down. It is positioned under a branch to catch falling insects dislodged by giving the branch a few sharp taps with a stick. Having caught the insects you might want to try and identify them. There are a great variety of field guides to help you. To keep them is also very easy. Get a shallow box, plastic or coated wood preferably (glass lid for showing purposes only optional). Put a thin layer of styrofoam fitted and glued to the bottom. Insects will pretty much preserve themselves, i have a few samples that date back to 1918. Their exoskeleton hardly decays at all and they’ll dry up quite nicely in just a few days. Pin them in the thorax, not the abdomen (mid section, not the tail section), usually right between or just below the wings. Use entomology coated needles (black, coated needles that don’t rust easily and are 1 mm thick) for small insects, and large entomology needles (2 mm) for bigger insects. Positioning is very important, always carefully strech the legs out to resting position and lay the wings out flat (eg butterflies and flies) or one folded and one extended in the case of coleopterans (beetles) or hemipterans (bugs) and such. Positioning MUST be done when the bug is freshly dead (no more than two days dead), do not try to position a dry bug because you’ll break it, and once it’s broken it’s unacceptable. 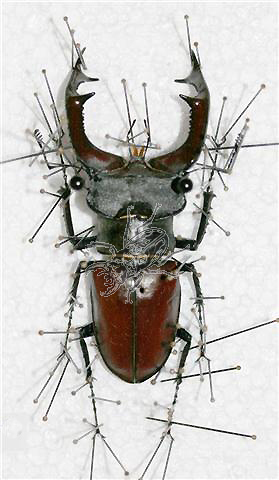 Insect decay happens for two main reasons: improper care and dermestid beetles. Caring for your insects is very important, keep dust from getting into the boxes by not leaving the box open for extended periods of time and keep them in a cool, dry place (basements are a really bad idea, fungus will destroy your collection in a matter of years). If you must keep them in a humid environment keep silica gel packs in the boxes to absorb humidity, but the gel packs must be replaced or refilled regularly, six times a year). As for dermestids, a bit of naphthalene (moth balls) in a paper envelope will keep any chitin devouring insects away from your collection. I hope this information helps – if you have further questions let me know.